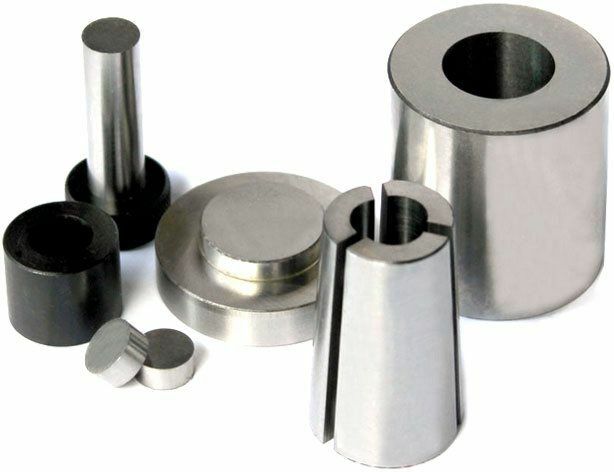 A set of 6mm diameter (ID) hardened steel trapezoidal split sleeve dry pressing die set for pellet presses, ready for you to make 6mm diameter cylinder-shape pellets. These die sets are professionally built for you to work with samples that tend to stick to the inner surface of the sleeve, trapezoidal split inner sleeves with pellet ejector make sample releasing a snap. Clean the die set throughout with absolute ethyl alcohol and keep them in a dry box with silica gel after use to avoid rusting on the surface. Never fill the die more than 2/3 its sleeve height with your sample and do not apply pressure beyond 4 tons. Across International is not responsible for any damage caused by misuse. 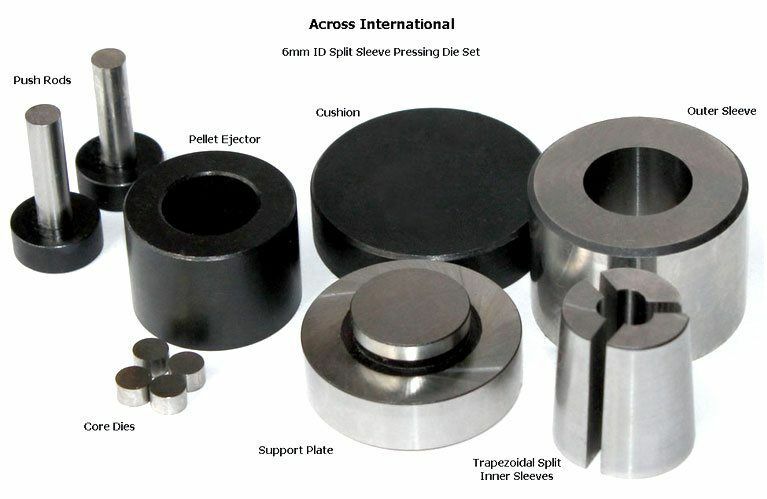 A set of 13mm diameter (ID) hardened steel trapezoidal split sleeve dry pressing die set for pellet presses, ready for you to make 13mm diameter cylinder-shape pellets. Never fill the die more than 2/3 its sleeve height with your sample and do not apply pressure beyond 15 tons. Across International is not responsible for any damage caused by misuse. 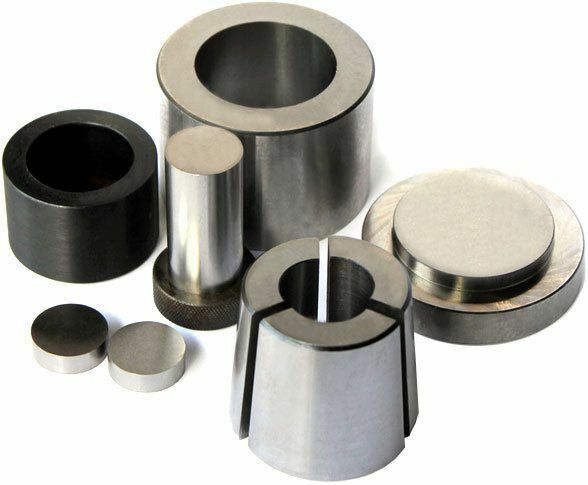 A set of 25mm diameter (ID) hardened steel trapezoidal split sleeve dry pressing die set for pellet presses, ready for you to make 25mm diameter cylinder-shape pellets. Never fill the die more than 2/3 its sleeve height with your sample and do not apply pressure beyond 30 tons. Across International is not responsible for any damage caused by misuse. 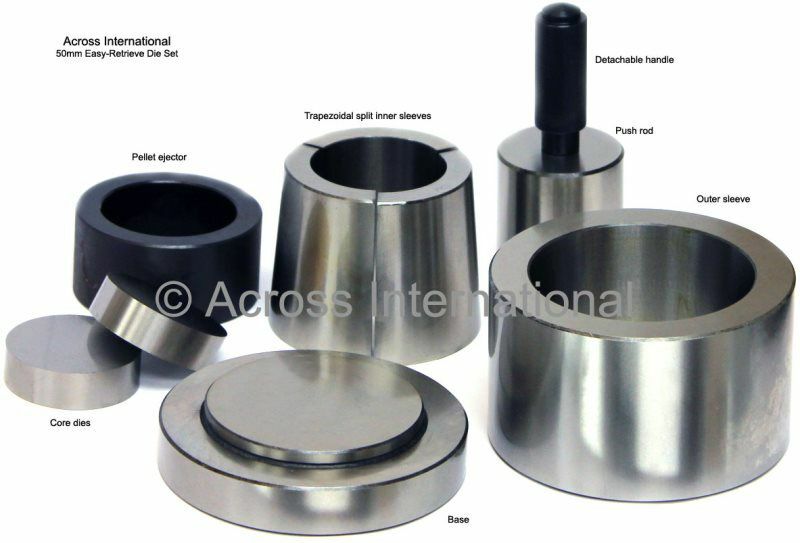 A set of 40mm diameter (ID) hardened steel trapezoidal split sleeve dry pressing die set for pellet presses, ready for you to make 40mm diameter cylinder-shape pellets. 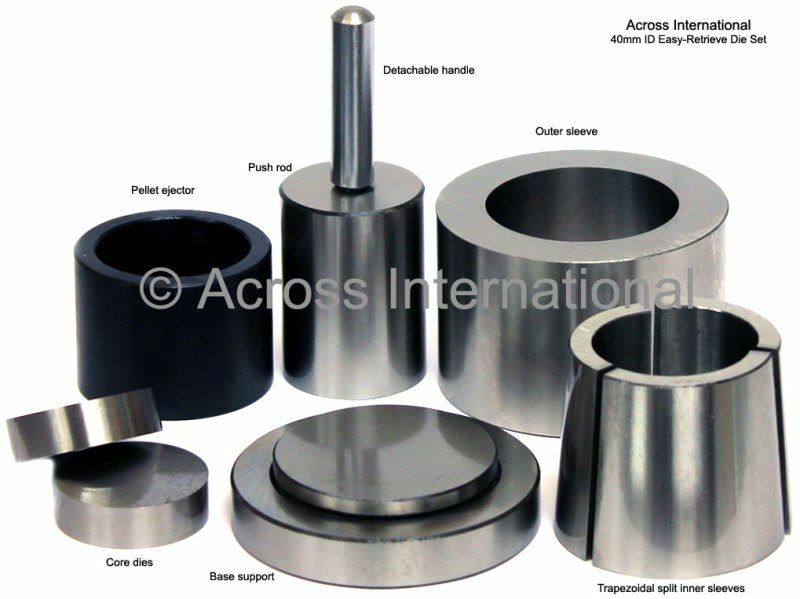 A set of 50mm diameter (ID) hardened steel trapezoidal split sleeve dry pressing die set for pellet presses, ready for you to make 40mm diameter cylinder-shape pellets.